Holmesy likes to keep comfortable in early spring and spends his time enjoying it not enduring it. As the old grey hair starts to take hold, one thing becomes apparent to me – sometime the history we have with our Carp fishing can be a hindrance rather than an advantage. The term ‘old dog’ and ‘new tricks’ springs to mind but, with careful, rational thinking maybe we can start to understand our hindrance and pro-actively turn them into advantages. Over the years I have seen quite a few new anglers fish the waters I have been fishing and, indeed I have been the new boy from time to time. Without generalising too much a pattern seems to have appeared where the new anglers have seemed to have initially good catches – why should this be so? I believe that because a new angler on a water doesn’t have any history to relate to, he or she has to view the situation as it is in front of them. This leads to a fresh and sometimes different approach to what has been done in the past. It can take the form of baits. Has the water been predominantly baited with boilies? If so, what type of boilies? Were they fish- meals, bird food based, high attract, glugged? They will be asking themselves all of these questions. Normally there is a chance that the new angler will find out what has been used and will probably want to use something different. As mentioned, there are many permutations they could possibly use. They will also, not only need to know roughly what types of bait have been used but also how much it has been applied. Believe me, on some of the waters I have fished in the past, heavy baiting campaigns have really produced the fish for those lucky enough to be first to adopt those tactics. However, as we know nothing stands still with our beloved Carp and, without doubt on waters that have seen that approach, it doesn’t last forever. Eventually the fish will become agitated about moving over beds of bait and, in extreme cases won’t even do that but literally ‘bow wave’ away. In these extreme cases our new boy will have to think of a different approach. 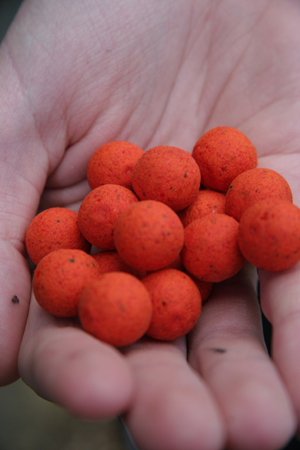 Deciding on what bait to use and how to apply it is very much an important part of early season carping. Single hook-baits, smaller boilies, baits positioned in safe areas (weed, near to snags) maybe even to fish particles as the pull-in attractor and boilies only as the hook bait. He could also fish particles as his hookbait and decide upon a mass-baiting programme. Small seeds such as hemp seed could be used or if he wanted to be completely different maybe use red dari or some other small particle. Carp will really tear up the swim once they have been turned onto small particles. All these options are available. Our regular who has fished the venue for a few seasons and has done really well, will find that this history will cloud his judgement. We are all guilty at times of staying too long on any method, particularly if we have done well in the past on it. However, this problem is one that the new breed of bounty hunter type of Carp angler doesn’t usually suffer – they target a particular fish and when it has been caught, they move off. To combat this malaise, we have to try and keep thinking about what the Carp would be thinking. I can remember a good fishing friend of mine telling me to imagine what the Carp would want. Food, quiet and security. Keep these in mind and try to come up with a solution for each one and you will catch. I remember at the time feeling he was giving the Carp too much brainpower – it’s only a fish, but he caught. Very much like most animals the instinct of Carp are based on a certain curiosity and this can lead to bonus fish. Plastics and high coloured single hook baits are clear examples of this. Personally, if my chosen water was for a season, I would want to try and establish a bait and try and make that bait something the Carp would want to eat, and in quantity. This is based solely on the competition element that I want to develop. This plays such a part in Carp making mistakes. Even wary ones. The first time you see a water make a note of the other anglers. This guy on the far side was a regular so I asked for as much information as possible! Location is also something that our new guy will be thinking about. Swim choice will not be based on the going swims of old but on a feeling of where the fish will be. 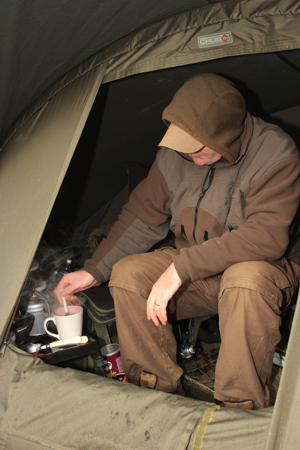 Weather conditions, sighting of fish, angling pressure are all options that will be going through their mind. The long walk that is a grueller, the swim that is rat infested or insect ridden or not big enough for mountains of gear – all these worries should not be clouding the mind of our newby. Usually, if I am presented with a new venue and thinking about where I should fish, I start with the current weather conditions but need also to move away from pressured areas. Remember, we are not talking about a ticket water here – this is where we have committed ourselves for the season. Our next kid will also have visited the water prior to fishing it, he will have spent his time being there at the optimum feeding times, dusk or first light. This will build up a picture of the mood of the lake. Beware here, some waters prohibit non-anglers. The worse scenario would be to fall foul of the rules before you even wet a line! Careful observation and knowing the time I could expect a bite resulted in this cracking 39lb male Carp. Assessing when you will be fishing the water is also very relevant. It goes without saying that weekends will be busy but it may be that that is the only time available. Initially this can be turned into a positive aspect – you will soon realise how much pressure the fish get and where they get it. This can help our newby to evaluate where their best chance of success will be and if they can use all the accepted fish locaters. It is hardly useful following a south westerly wind, if all the swims are taken. Likewise, casting at fish jumping and swirling is fine if you have the room but, if the water is full of anglers you could have a problem. All of these scenarios can seem to stack the odds against you but can be overcome, dependant on their severity. One particular syndicate I was on, held a draw each Friday morning to choose swims. The draw took place at 11.00am when I was 150miles north in an office trying to earn a living! Sometimes one can be different for the sake of being different and you must always remember that there could be a good chance that popular spots are popular because they produce fish. 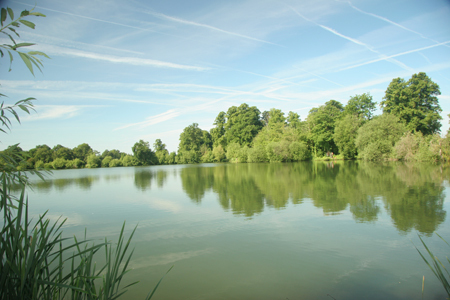 When new on the water, it is always wise to try and develop your tactics, your baits and your fish. Try to tread your own path and not follow. You will have to work harder but will reap the rewards, not share them. 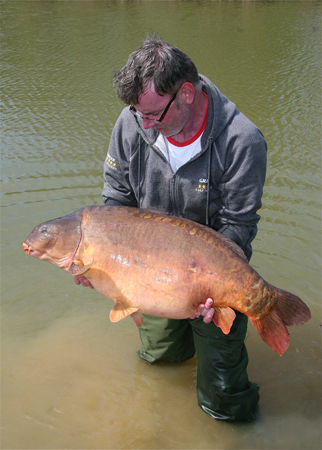 Confidence is a word that is often used in Carp fishing and can be a little overstated. There is no doubt however that it can sometimes be the missing link. The logic behind it seems a little unclear but I feel it is more a mind set. When you feel confident you fish a little harder and a little clearer. The fish are something that cannot win and there is only one outcome… you will catch them. As I keep saying our sport is the only one where time can be a substitute for skill. When you are new to a water that has to be at the core of what you do. The treasures of the water are there, waiting for you to pick them up. A cracking mid thirty caught on a bait I know had never before been caught on. How do I know? It was one of my own! One other tip that I think is vital is to make notes of your experiences. Weather conditions, water temperatures and barometric pressure all need logging down. At one time water temperatures and air temperatures were always recorded but, due to Carp being caught in all different types of conditions, it seems to have gone out of fashion. People missed the point as adverse, as well as favourable conditions were also part of the catch jigsaw. However, when new to your water you are looking for coincidences that become relevant and, unless you have a photographic memory you can soon miss things. Along with a topographical map, the mood of a water can also be of great use. I can remember two waters in particular that I fished , where I knew you would get a take between 10.00pm and 10.30pm. If you looked at my old fishing logs you could quite quickly see this pattern emerging. When I looked at my weather conditions, I soon realised that it was the prevailing winds that had dropped and caused the fish to move back into their holding areas in the weed; that was the reason why I caught. You’ve guessed it – to get to those areas they moved through my swim! Try and not clutter your mind with too much information and work your way through any problems. Good luck and see you on the bank. 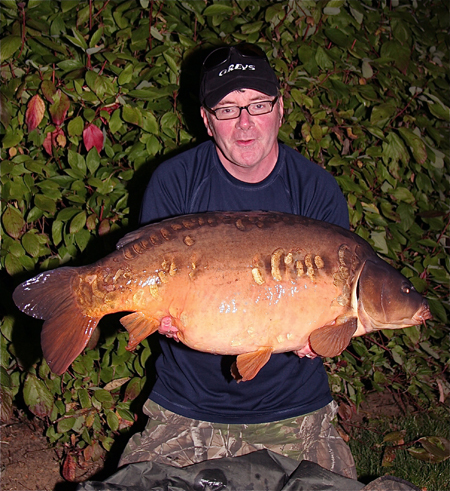 This entry was posted in Techniques and Methods and tagged carp fishing, carping, mark holmes. Bookmark the permalink.